The challenge for April at Kraft + is a recipe challenge. Something old, something new, something borrowed and something blue. 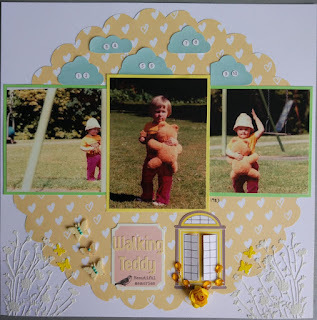 It came at just the right time as I was away at a scrapbooking retreat in the middle of April, plenty of time to make something and "borrow" from a friend. I used our favourite wedding photo and a sketch from a friend at retreat. Something new is the papers and red roses. Something old is the letters. 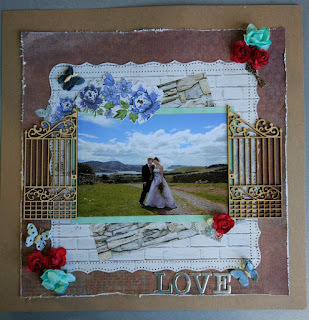 Something borrowed are the gates and use of the border punch used on the brick paper. Something blue is the flowers and butterflies. Was very happy to get some help from two very knowledgeable ladies at retreat to help make this come together. Oh this looks so beautiful. I love the gates and that photo is stunning.. thanks for joining in with Kraft+ this month!! 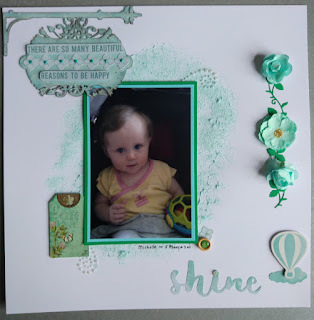 Super pretty with the fussy cut flowers and the gates to new beginnings. Thanks for joining us at Kraft+ this month..